Book/CD pack. 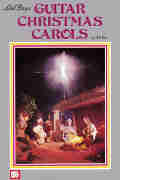 17 traditional Christmas carols arranged for fingerstyle guitar. Songs are presented in separate notation and tablature sections. Intermediate/advanced. Comb-bound. 74 pp. There are 50 well known waltzes fully notated in the book and played on the CD with a full backing band. Play-a-long tracks including melody line played by another instrument.